Provide comfort for the family of Raymond Kann with a meaningful gesture of sympathy. Raymond L. Kann, 72, formerly of Shippensburg, late of Houston, TX, departed this life on March 20, 2019. He was born on September 10, 1946, in Cumberland County, Pennsylvania, the son of the late William and Julia Reath and was a 1964 graduate of Shippensburg High School. Shortly thereafter, Ray was inducted into the U.S. Army, serving in the Vietnam War as a member of the United States Army Special Forces (aka Green Berets) which later became the 1st Special Forces Command (Airborne). For distinguishing himself by heroic and meritorious performance of duty while in combat, Ray was awarded the Bronze Star, and for wounds received while engaged in combat, he received a Purple Heart. Following his proud service in Vietnam, Ray remained in the military and was stationed in Germany and later at Ft. Ord in Monterey Bay, California, until his retirement in October of 1988. 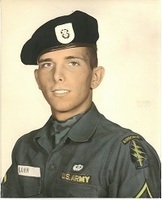 Upon his retirement, Ray held the rank of Sargent First Class. He came back to Central Pennsylvania to work at the Letterkenny Army Depot, Chambersburg, before eventually moving to Texas. Ray is survived by his daughter, Jennifer Kann of Moreno Valley, CA; and three sisters, Grace Keiter and Josette Wingert of Shippensburg and Sue Ann Kann of Chambersburg. In addition to his parents, Ray was preceded in death by his son, Stephen Kann. His remains will be interred at a National Cemetery, bestowed with full military honors, at a later date. The Fogelsanger-Bricker Funeral Home & Crematorium, Inc., Shippensburg, is assisting his local family regarding his funeral arrangements. Consider providing a gift of comfort for the family of Raymond Kann by sending flowers.